It’s not just the drivers who must endure. How about those poor wet and wind-swept fans? Every year in rural France, hundreds of thousands of people flock to a small town: Le Mans. It’s the stuff of sports and movie legend where drivers race on public roads for 24 hours, facing the ultimate test of speed and endurance, twice around the clock. Steve McQueen loved it so much he made a film about it when he actually drove himself. Paul Newman entered in 1979 and came second overall. It’s the world’s greatest race and, more recently, it’s been hugely popular with Danes. It all started with John Nielsen in the mad, fire-breathing 220 mph Jaguars of the 1980s. Then the 1990s saw Jan Magnussen and Tom Kristensen take up the mantle, and Danish fans became famous for their beer bottle pyramids, singing during the Le Mans parades, and campsites featuring discos, rooftop bars and light displays surrounded by cars made unrecognisable due to all the stickers and national flags. Just over 263,500 spectators camped within the 13.7km Circuit de la Sarthe, of which almost 40,000 were Danes who’d made the trip especially. Imagine all of Rødovre or Brøndby decamping and pitching up, under canvas, two hours southwest of Paris. For a week in June, Le Mans almost enters the Top 20 most populous Danish cities in the world. Why? Because Denmark’s so good at endurance races they should make it the national sport – that’s why. This year’s race was one for the ages: foul weather, close battles and a last-lap lead change for the win. However, there were some promising Danish stories as well. Christina Nielsen, who missed out on the IMSA SportsCar Championship by two points in 2015, became the first ever Danish woman to compete in Le Mans, racing as part of the all-Danish Formula Racing team – on the grid by virtue of being 2015 European Champions in their Ferrari 458, and looking to give Christina the same success her father Lars-Erik enjoyed in the early 2000s. Jan Magnussen was back for the canary yellow and deafeaningly loud Corvette Racing team, driving something that was more like an earthquake on wheels than a car at his 17th consecutive Le Mans. Gentleman driver and tech wizard David Heinemeier Hansson was out in a Porsche looking for his 3rd class victory to cement his status as one of the best amateur racers around. Michael Christensen raced for US actor/racer Patrick ‘McDreamy’ Dempsey’s team in the legendary Porsche 911 that took him to three wins in last year’s World Endurance Championship. Finally, the fans-favourite Aston Martin ‘Dane Train’ was back to defend its success. As usual, the Danish fans turned up with tents, camper vans, beers and homemade methods of transport to see the action unfold and leave their mark on France for another year. I can’t do justice to the madness of Le Mans here. It’s a visceral, brutal few days: caffeine, all-weather BBQ heroics, a circuit that mixes arenas and stadiums with narrow, twisting public roads between villages. Headlights through the trees at night. Rain and spray sent into huge plumes by the sheer speed of the cars. A constant wall of colour and light and sound. The fans’ 3am dance anthems, lit by cars spitting fire and flashing headlights, fans with torches and lasers, the red blink of a TV camera and huge, backlit advertising boards make sleep almost impossible. It’s hard to win a race when a wheel falls off your car. That’s exactly what happened to the Formula Racing team, as the only all-Danish entry found their Ferrari limping back to the pits early on missing a vital component. Consistent speed throughout the night from young gun Mikkel Mac, Christina Nielsen and older but very capable amateur driver Johnny Laursen saw then scrapping their way back up the order until Nielsen had a suspension issue on Sunday morning. The team managed to quickly repair the damage and fought hard to the flag, coming home an impressive 6th in class. Take that as a statement of intent from the European champions, none of which had ever raced in 24 Hours of Le Mans before. Come 3pm on Sunday afternoon, the Danes were cheering as loud as anyone, despite not having much to cheer about. The Dane Train was beaten to the podium by a determined and well-funded Ford effort on the 50th anniversary of their first win. 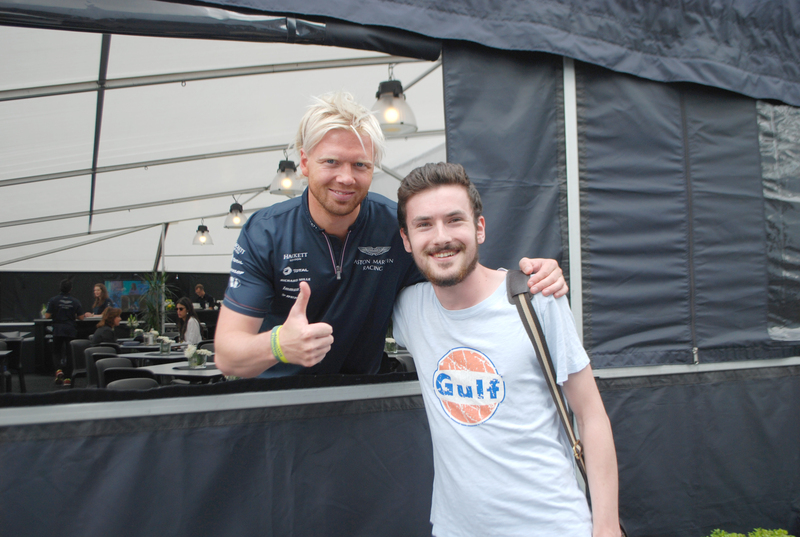 However, they did win ‘Top Dane’, thanks in no small part to Nicki Thiim’s marathon efforts throughout the night. And a honourable mention must go to David Heinemeier Hansson, who as a passionate amateur regularly turned laptimes within two seconds of his teammate Patrick Long, multiple winner and one of the fastest in the world in a Porsche. Having experienced weather more like Copenhagen in November and campsites that became mudbaths, the thousands of Danish fans were as committed as ever. They’ll be back next year with more flags, louder voices, higher hopes and bigger smiles. Until next year, Le Mans, tak og farvel! Nicki Thiim has some of the hardest boots to fill – those of the late Allan Simonsen. The spectacularly quick and humble Dane was instrumental in the success – both on the track and with the fans – of Aston Martin’s now traditional ‘Dane Train’ effort. Following Simonsen’s tragic crash at Le Mans in 2013, Thiim came to Aston Martin to keep the Dane Train on the rails. His speed, smile and helmet-proof hairstyle have made him a favourite of the race. Thiim’s father Kurt was a very successful racer a couple of decades ago, and it seems to run in the family – Nicki won at Le Mans first time out in 2014. 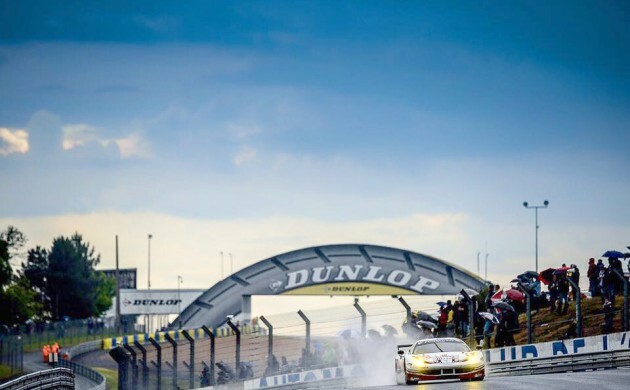 So, Nicki, Le Mans is one of the biggest, if not the biggest, international sporting event for Denmark. As a Danish driver, how do the famous fans and increased attention from home change the feeling of Le Mans compared to other races? Yes of course, Le Mans is the highlight of the year, especially for us at Aston Martin. On top of that there are between 30 and 40,000 Danish fans here every year! Every year we visit the fan camps and meet our fellow Danes. Seeing all the flags and fans really makes you realise every time how massive the Danish fanbase and passion is at Le Mans. When you’re wearing your helmet, driving the car out there and you see the Danish flags and banners … this really makes me happy. What’s your best memory of Le Mans? Definitely my first Le Mans race in 2014 so far. To get there, where everything was an unknown, and then to win at your first race at Le Mans is really impossible to beat. I don’t think I will ever be able to beat that one. John Nielsen and Tom Kristensen began the love of Le Mans in Denmark, and Jan Magnussen keeps it up now. How does that support young Danes coming through the ranks aiming to continue the Danish story at Le Mans? Of course that’s something you get to hear a lot. I respect both John and Tom and their achievements. I know there are some people out there who try to use their legacy for their own personal advantage. Still, I’m not here because of them. Inspired by my father Kurt, I’ve worked very hard from a very young age to get here. I’m where I am because I had to prove myself in many different classes and cars over the years. He’s in the Dane Train, but British: your co-pilot Darren Turner’s being made an ‘honorary Dane’ by the media – are you making him fit in by teaching him ‘rødgrød med fløde’, getting him to ride a bicycle everywhere, dressing him in black etc? Darren is one of the best drivers I’ve shared a car with. Experience is key in endurance racing and Darren, ‘Mr Aston Martin’, has a lot of it. We still have to work hard every day though – he really is the perfect guy for this team and I’m happy that he’s a part of it. After the race we have more time to make him a proper Dane and have fun. Now we are fully focused on the big race.